* Graduate Realtor Institute of Alabama – Professional Designation (GRI) – The GRI symbol is the mark of a real estate professional who has made the commitment to provide a high level of professional services by securing a strong educational foundation. * Sales Associate – Century 21, First Real Estate Corp. of Alabama, Lowder Better Homes and Gardens, RE/MAX. Gordon has received various sales awards for outstanding achievement in residential and commercial sales. Other business experience includes Professional Office Management – United Appeal, Southern Research, Birmingham News Public Affairs, Birmingham Trust National Bank; First Baptist Church Center Point (Birmingham) – Director of Activities and Manager Activity Building. Gordon’s service goes beyond her business; she is also active in other areas. 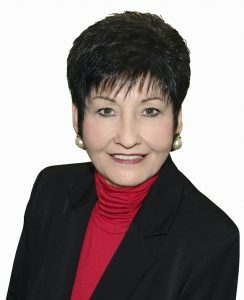 She has volunteered in a literacy program to teach adults to read and write; taught Interior Design classes at Jefferson State College, Birmingham; currently serves on the Advisory Committee for the Atmore Community Foundation; member of First Baptist Church of Atmore; serves on Board of Directors and as past president of the Board for the Little Rock Volunteer Fire Department. She also serves as vice president, secretary / treasurer Peacock Enterprises, Peacock Pavers, and Enhance Architectural Products. Also, as owners of The Club, the Gordons are known for their generosity in providing the venue free of charge for a number of organizations through the years. A native of Atmore, Gordon is the daughter of the late A.J. and Lucille Mitchell Peacock. She’s been married to Don Gordon for 48 years, and they have one daughter, Dr. Amber Gordon (husband Brad Butler and son Alexander Butler). Information provided by the Hall of Fame Committee.